After months of campaigning, business mogul turned celebrity politician Donald Trump and former Secretary of State Hillary Clinton have clinched  the number of delegates needed to win their respective parties’ nomination for the US presidency. 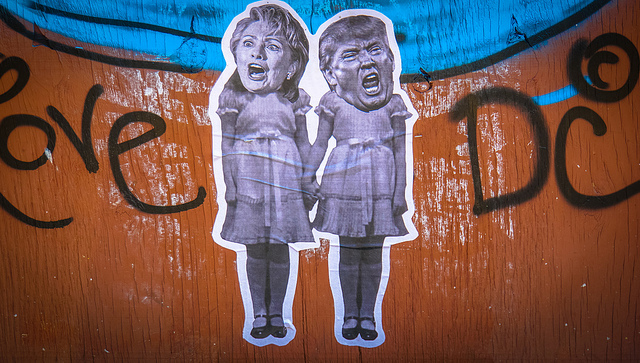 With the nominees all but confirmed, global attention is now turning to the policies that will define a Clinton or a Trump presidency. Of particular interest is what will become of President Obama’s policy legacies, including the US rebalance to the Asia–Pacific . The US ‘pivot’, later relabelled  rebalance to avoid the negative implication that the US might avoid its responsibilities elsewhere, acknowledged the increasing importance of the Asia–Pacific and signalled a new era of security policies focusing on US engagement with the region. Through diplomacy, military cooperation and stronger economic ties, it aimed to cement a broad balance of power that would allow the US to maintain and expand an inclusive and rules-based regional order. Of the two, Clinton appears more inclined to continue the rebalance. During her time as Secretary of State, Clinton played a pivotal role in the creation and implementation of the policy shift, going so far as to declare  ‘America’s Pacific Century’ in 2011. During her four-year tenure, she made 62 visits  to 26 Asia–Pacific countries—including her well-publicised ‘listening tour’  of Japan, China, Indonesia and South Korea in February 2009—pushing for enhanced diplomatic and economic ties with regional partners. Given her long history of diplomatic engagement in the region, Asia–Pacific leaders will likely be assured  that Clinton’s personal commitment to the region will continue during her presidency. As a product of the traditional Washington foreign policy establishment, Clinton is an avid believer  that the US should maintain its position as the leader of world affairs. That view, combining humanitarianism with a hard-line willingness to use coercive force when necessary, will likely see her strengthen America’s traditional and burgeoning partnerships in the Asia–Pacific. On China, Clinton is widely expected to be more assertive  than her predecessor and apply greater pressure  on Beijing over maritime issues and its assertive behaviour in the region. Clinton’s position on the rebalance is markedly less clear from an economic perspective, compared with her position on diplomacy. Her view of the Trans-Pacific Partnership  (TPP), considered by many to be a cornerstone of the rebalance, has changed significantly since she announced her presidential ambitions. Having slated the TPP as the gold standard in trade deals in 2012, she has since voiced her disappointment  at the final deal, because it didn’t meet her standard of guaranteeing more jobs and better wages for Americans. Given the Democrats’ middle-class voter base, that position during an election campaign isn’t surprising. It’ll be of interest to see if that position evolves if she’s successful in November. Clinton hasn’t detailed whether she’d seek to renegotiate with the 11 other TPP nations as president, however, a foreign policy advisor has suggested  that Clinton still supports the goals of the TPP that advance US interests in the region. While it would remain up to Congress to ratify any deal, this seems to suggest that the opening of trade links with partners in the Asia–Pacific would be on Clinton’s agenda in 2017. The potential of a President Trump raises far more questions for the future of the rebalance. His ‘America First’  strategy features a myriad of ideas that don’t fall into any established foreign policy camp, or indeed appear to follow clear lines of reasoning. His nationalist isolationist tendencies, however, are a cause of deep concern for those in favour of the rebalance. Trump’s view of the US alliance structure within the Asia–Pacific is at clear odds with the nature of the rebalance. He’s previously suggested  a withdrawal of US troops from Japan and South Korea, imply ing that the US gets nothing from the US–Korea alliance. On issues of the South China Sea, he has displayed an almost deliberate lack of interest in increasing the US military presence in the region. He has also derided engagement with the region’s maturing multilateral institutions, commenting  that he was ‘sceptical of international unions that tie us up and bring America down’. With those remarks, Trump could not only threaten the success of the rebalance, but also undermine the core principles of modern-day US strategic policy. On relations with China, Trump appears singularly focused on economic issues, with the constant affirmation  of a ‘strong and smart America’ that doesn’t let China take advantage of it. In an attempt to boost the US manufacturing industry, he has declared  China a currency manipulator, proposed  a 45% tax on Chinese imports ‘if they don’t behave’ and called  for an end to Chinese export subsidies. The TPP therefore seems doomed to fail under Trump. He has voiced dissatisfaction with the TPP, labelling  it a ‘horrible deal’ that will ‘lead to nothing but trouble’ for Americans. Given that it’s commonly believed  the TTP was designed with the intention to exclude China and prevent it from benefiting from the preferable market access members will enjoy, this steadfast opposition seems contrary to his goals of restricting Chinese growth and indeed the traditional trade inclination of the Republican Party. Whichever way the election plays out, the future of the rebalance is likely be uncertain come 2017. Neither candidate has given the actual term ‘rebalance’ much airtime during the campaign to date, perhaps in an attempt to separate themselves from the Obama legacy. There remains the possibility that the TPP will be ratified during the ‘lame duck’  period post-November, taking that particular issue off the table. Given the instability in Africa and the Middle East, Clinton may be hard-pressed to go against her interventionist tendencies and focus her attention more squarely on the Asia–Pacific. Then there’s the Trump factor. Even if he is unsuccessful in his presidential bid, the deepening nationalist sentiment that he has tapped into may remain a part of the American psyche for years to come. Regardless of whether it’s Trump or Clinton in the Oval Office, the next president may well be faced with an American public still seeking to redefine their country’s role in the world. Dione Hodgson is a research intern at ASPI.